Brandubh is the smallest member of the Tafl family of games. Its name means “Black Raven” in Gaelic (Irish), and it is known to have been played in Ireland at least a thousand years ago. Despite its small size, it is a tricky and interesting game, though short, and is quick to learn but difficult to master. It is played on a 7 x 7 board, with the corners and centre square marked – these are special squares. The two players have different aims in the game. The white player wins by moving the king piece to any corner square. The black player wins by capturing the white king. The two players have different forces to work with. 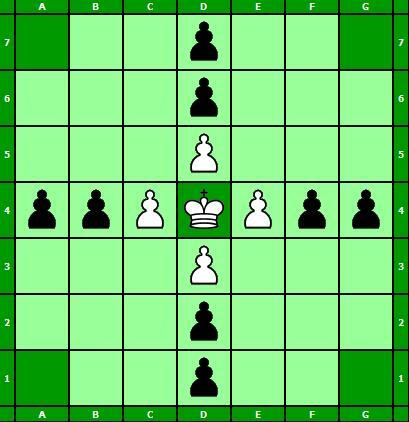 White has a king and 4 warriors. Black has no king, but 8 warriors. You can capture an enemy warrior by surrounding it on both sides with two of your own warriors. They must be standing on opposite sides, either in front and behind, or to the left and right, not diagonally. 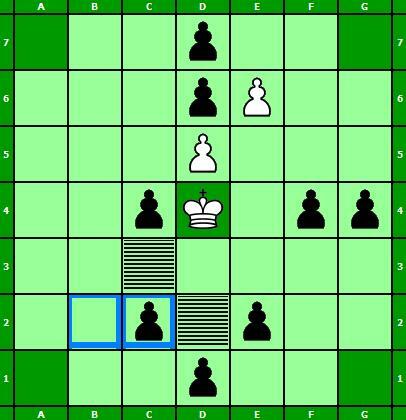 A piece that becomes trapped like this by an enemy move is captured and removed from the board. However, it is safe to move into a gap between two enemies without being captured. The King may participate in capturing, just like any other piece, and he may also be captured just like any other piece. It is possible to capture more than one piece at a time, but not if they are standing together in a row. The central square (known as the “throne square” because the king sits there at the start of the game) and the four corner squares are restricted. Only the king may occupy any of these five squares, though any warrior may pass through the throne square when it is empty, without stopping on it. The king may return to the throne square after he has left it, if required. The king can be captured while on the throne, just the same as on any other square, by being surrounded on two opposite sides. In addition, the four corner squares and the throne square are “hostile squares”. This means that they can play the part of an enemy warrior of either colour for the purposes of capturing. Any piece, including the king, that is occupying a square next to the corner square, can be captured if an enemy piece moves in behind it, trapping it against the hostile corner square. Similarly, a warrior standing on one of the squares next to the throne square may be captured by an enemy piece moving so as to trap it against the hostile throne square. The exception to this is that the throne is not hostile to white warriors when the king is occupying the throne. As soon as the king moves off the throne, the throne square becomes hostile to white warriors as well as black ones, and any white warriors still in their starting positions therefore become more vulnerable to capture. When occupying the throne square, the king must be surrounded on all four sides to be captured, instead of two. When the king occupies a square directly next to the throne, he must be surrounded on the other three sides, with the empty throne making up the fourth side, to be captured. This means that the five squares which are occupied by white at the start of the game (the throne square and the four squares next to it) are relatively safe squares for the king, as it takes more black warriors to capture him on those squares. both players agree to a draw at any time. when on the throne square in version 2.
when on one of the squares next to the throne.